"Mother, May I?" As of January 26, it became illegal to unlock your smartphone without your carrier’s permission in the USA. Jailbreaking an iPhone is still OK, though. Acer says that Chromebooks now account for 10% of its U.S. PC shipments. Meanwhile, Acer president Jim Wong says Windows 8 has done essentially nothing for PC sales. "Would you like fries with that?" The $166 Hyundai T7 tablet sports a 7 inch IPS display, quad-core processor, 8 GB of RAM, GPS, Bluetooth, and dual cameras. 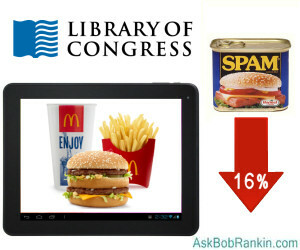 If Android phone and tablet prices keep dropping like this, they’ll soon be on McDonald’s value menu. Is Facebook really demanding your government-issued photo ID, or is it a scammer? The social network says it’s for real. Some users have been locked out of their Facebook accounts for alleged violations of the site’s TOS, and told to email color scans of their photo IDs to regain access. Instagram, now owned by Facebook, is doing the same. Good News, Bad News: Spam email has declined dramatically since its peak in 2008, from 80% to 67% of global email traffic, according to statistics released by Kaspersky Labs. The bad news is that scammers are switching to online ads. Windows 8 may not be doing well by Microsoft, but at least one computer shop has found a way to make money with it. The unidentified store will downgrade your Windows 8 PC to Windows 7 for only $125. "There's no free lunch, but you can sit here and read forever." Freebook Sifter is a free service that finds all of the 30,000+ free e-books on Amazon and neatly categorizes them for your browsing and downloading pleasure, for free. Hmmm, kinda like one of those "library" thingies. "Apple cobbler, anyone?" Apple has filed a patent on a shoe wear-out sensor system that will tell you when your shoes have reached “critical wear level” and should be replaced, even though they may look fine to you. Kinda like inkjet cartridges for your feet. The Kindle Fire has captured 33% of the Android tablet market, making it the runaway leader. The Barnes & Noble Nook has 10%; Samsung Galaxy, 9%; and Google’s Nexus 7, 8%. Most recent comments on "Geekly Update - 30 January 2013"
"... Kinda like inkjet cartridges for your feet." You are SO creative, Bob. Didja ever do standup comedy? Seriously. "The unidentified [computer] store will [B]downgrade[/B] your Windows 8 PC to Windows 7 for only $125."